What Is The Best Bowie Knife? 1 What is a Bowie knife? 2.1 How to choose a Bowie knife? Bowie knives are here since the 19th century. That is a long time, but do you know how to choose the best Bowie knife? I’ve read countless Bowie knife reviews and tried many of them myself to put together this top 10 list and Bowie knife buying guide. We will go through a bit of the knife’s history, important factors to consider when choosing the right Bowie, and of course there will be a top 10 list to quickly choose one of the best-rated Bowies. A lot of time has gone by since the birth of this knife and it has undergone so many design changes that many of the today’s Bowies are no longer looking like the original. The original Bowie knife was created by James Black for Jim Bowie back in 1830. Since there are no set definitions of the Bowie knife, it’s hard to describe it. It is typically a large fighting knife with its length raging from 12 to 30 inches. The blade is usually between 5 to 24 inches long, but be assured that the 24 inches Bowies look more like short swords or machetes than knives. The comparion chart below contains some of the most popular bowie knives. You can sort the rows by clicking the column headers. Weight is in ounces, length is in inches. Happy sorting! How to choose a Bowie knife? What factors should you consider when choosing the best Bowie knife? There are many general factors related to picking the right knives that also apply to Bowie knives. Construction – First and foremost, don’t even think about purchasing non-full tang Bowie knife. It is a large an quite heavy knife, you surely don’t want it to break into two halves. Length – Depending on what you are planning to use knife for, choose the right length of the whole knife and the blade. Carrying a 20-inch Bowie will surely make you look badass, but it won’t be practical, if want to use it for camping and hunting. I would personally shoot for something in the 12-inch range. Material – Go for high quality stainless or carbon steel. Cheaper steel may rust easily or hold edge badly. Also take into account the material of the handle. It should be made of something that doesn’t slip easily. Here we will go through 10 of the best-rated Bowie knives currently available on the market. Not all of them are the traditional Bowies, but I’m sure, you will like them anyway. Please note that they are not listed in any particular order. Let’s get started! With a sturdy 11-3/4 inch long blade, Cold Steel Natchez Bowie 01 Steel Knife is currently one of the most efficient hunting knives on the market. The handle measures 5-3/8 inches in length, so most of the strength is directed toward the blade. The blade is strength and made of SK-5 high carbon steel. Not only it can maintain its sharpness overtime, but it also delivers a razor sharpness. As for the handle, it is molded and has a solid cap to break things. Altogether, the knife weighs 24 ounces. It is quite lightweight when compared to other units in this segment. It comes with its own professional sheath. As no knife is perfect, this one has a few elements that may not make everyone happy. For example, its strength might be affected by the fact that it is not a full tang knife. The good news is that it does have a partial cable tang. 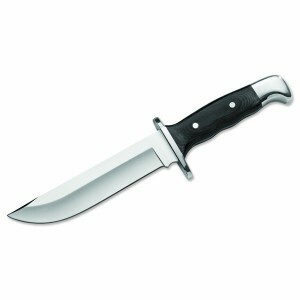 Click here to get the Cold Steel Natchez Bowie 01 Steel Knife on Amazon! When looking for a portable and lightweight hunting knife, Buck Heritage Series Frontiersman Micarta Handle Knife might become the ideal choice. This knife comes with a 6.25 inch long blade. It is straight and made of 420HC steel, but it also comes with a satin finish. As for the handle, it measures 5.5 inches. Proportions are fine to deliver more power toward the tip of the blade. 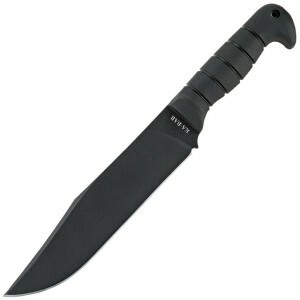 The black Micarta handle adds to its durability. The good news is that it also comes with a guard, so getting injured is almost impossible. Finding a perfectly matching sheath for a knife can be tricky, but this model has its own. It is black, sturdy and made of genuine leather. At first, the sheath might feel a bit tight, so pulling the knife out can be difficult. Be careful when you put it back in or you risk damaging the sheath. After a while, it will loosen. Click here to get the Buck Heritage Series Frontiersman on Amazon! SOG Specialty Knives & Tools SB1T-L Super SOG Bowie Knife does not leave room for misinterpretations when it comes to its construction. It is a solid knife that can make your outdoor adventures a breeze, whether you like to go camping or your craft around your backyard. It has a straight and fixed blade that measures 7.5 inches. It is entirely made of AUS-8 steel, but it also has a clip point shape. The black TiNi finish is durable and good looking. On the other hand, the handle consists of leather washers. It fits comfortably and is less likely to slip. This knife has a black leather sheet, as well as a belt loop attachment. It weighs 17.4 ounces, so it is quite lightweight for its size. The handle measures 5.38 inches. If you have a small hand, it might feel a little hard to control. The good news is that it does not slip. Click here to get the SB1T-L Super SOG Bowie Knife on Amazon! When in need of a quality knife for hunting or other outdoor activities, Timber Rattler Western Outlaw Bowie Knife steps in to add to your overall experience. Its long blade makes it suitable in a series of situations. Overall, it measures 11-3/8 inches in length. It is razor sharp and entirely made of stainless steel. The handle is smaller, but altogether, the longer blade draws most of the strength. The knife feels like it works by itself. When it comes to the handle, it is gray and made of hardwood. It is treated to prevent swelling or shrinking though. It has a brass plated guard as well, so injuries are properly prevented. The knife comes with a genuine leather sheath. It also has a full tang blade for durability and power. The bad news is that it may not be too suitable to those with small hands. Given its size, it will feel uncomfortable. 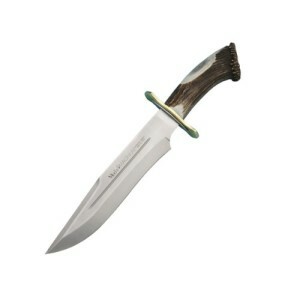 This knife is often marked as the best cheap bowie knife on the market with it price being set so low. 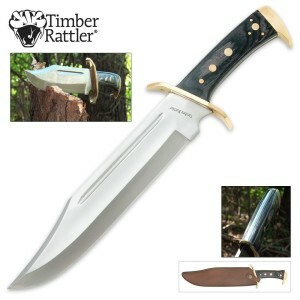 Click here to get the Timber Rattler Western Outlaw Bowie Knife on Amazon! The warrior appearance is probably the first thing to draw some attention in Ontario Spec Plus Marine Raider Bowie. This knife is rugged and harsh, but it also looks like it was specifically built to deliver, without caring for the looks. The blade is made of 1095 carbon steel and measures 9.75 inches. It is a plain edge blade. Another good news is that it has a full tang, so its strength will not be affected by the construction. In fact, you can use it to hunt, cut thin branches, garden, camp, build shelters and so on. The blade also comes with an anti-corrosion coating. Sheath is decent and durable. After all, this knife is made with military purposes and quality standards in mind. Plus, it fairly maintains its edge. It does feel a little heavy though – 22.4 ounces. But then, quality is never lightweight. Plus, it might need sharpening once you get it. 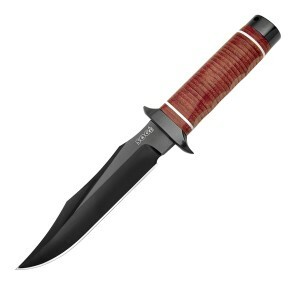 Click here to get the Ontario Spec Plus Marine Raider Bowie on Amazon! Ka-Bar’s knives have always been used in all kinds of military branches. Today, they are available to average users as well. You can get a professional Ka-Bar Becker BK9 Combat Bowie Fixed Blade Knife and use it in your everyday activities, on your camping trips or while hunting. It has a fixed blade. Just like any other Ka-Bar unit, it is fully tested for quality before being delivered. It comes with a powerful 1095 Cro-Van steel blade, as well as a compact Grivory handle. The handle is ergonomic and fits any hand out there. It feels comfortable and reduces fatigue over long sessions. The blade measures nine inches in length, while the handle is 5-3/4 inch long. The rapport is perfect to deliver more strength to the blade. However, with 1.05 pounds in weight, it might feel a bit heavy for newbies. Also, the sheath could have been better, especially for such a quality knife. Click here to get the Ka-Bar Becker BK9 on Amazon! 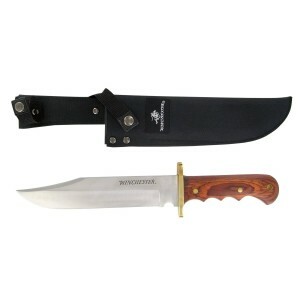 Gerber Winchester Large Bowie Knife, Brown leaves no room for mistakes when it comes to heavy duty outdoor activities. It is rated to be a hunting knife. It is just as handy for any other activity on a camping trip, from cutting branches to building shelters. When you first touch it, you can tell that it was built for intense operations. It is rugged and harsh, but it also feels reliable in any operation. Apart from everyday outdoor situations, it is excellent for tactical, survival, military and industrial applications, yet it has its limits too. Overall, the knife measures 15 inches. The blade is made of stainless steel and maintains its sharpness, yet it will require regular sharpening. The bad news is that it does not have a full tang, yet it looks like it does. With all these, it makes a good choice for domestic activities, as well as traditional outdoor adventures. 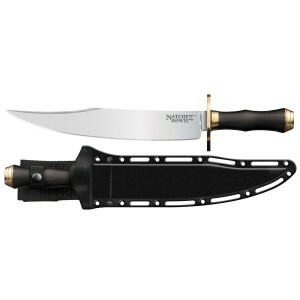 Click here to get the Gerber Winchester Large Bowie Knife on Amazon! Muela Magnum Fixed Blade Knife, Blood Groove, Crown Stag Handle might look a little unusual at a first glance, yet you would be surprised by its capabilities. The tactical knife is made in Spain. It comes with a 440 chrome-vanadium-molybdenum steel, as well as an impressive hardness. On the other hand, the handle is made of crown stag, but it also has a solid brass guard. The knife is so powerful and reliable that it was featured in a few action movies as well. The handle comes in the right size for an average hand, while the blade is longer. The power is transferred toward the tip, so it will feel like the knife is actually doing your job by itself. In order to make it even more appealing, the manufacturer has brought in a handcrafted leather sheath. It does feel a bit heavy though, so newbies might experience some discomfort while getting used to it. Click here to get the Muela Magnum Fixed Blade Knife on Amazon! When looking for a knife, it makes no difference why you do. As long as you do not use it in the kitchen, you want something powerful and military that can easily overcome all your everyday needs, whether you go camping or hunting. This is when Ka-Bar Heavy Bowie Knife, Large steps in – used in more branches of the military, but widely available for domestic uses as well. The dark appearance underlines the dangerous profile of this knife. As for sizing standards, the blade measures 9 inches in length, while the handle is 5-1/4 inch long. The power is sent toward the blade, so controlling the knife will be piece of cake. The blade is made of 1085 carbon steel, while the edge has a 20 degree angle. In other words, it is extremely sharp, but also likely to maintain this razor sharpness overtime. If there is one thing that could have been more professional, that is the sheath. Click here to get the Ka-Bar Heavy Bowie Knife on Amazon! From hunting and building shelters to camping and gardening, finding a general knife for all these activities can be hard. 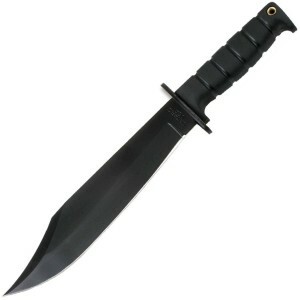 You want something strong and reliable, such as Ka-Bar Full Size US Marine Corps Fighting Knife, Straight. This knife is widely used in military operations too. If it can meet a soldier’s necessities, it can definitely meet yours as well. The seven inch long blade is ideal for all kinds of ops, but it also maintains its razor sharpness due to the 1095 Cro-Van steel construction. The handle is just a little shorter, so the knife is thoroughly balanced. All in all, this kind of design is currently the best rated one in terms of efficiency. The knife is made in the USA and built to North American quality standards. The handle comes with leather for a nonslip profile and durability. It also has its own professional sheath. However, the sheath could have been sturdier. 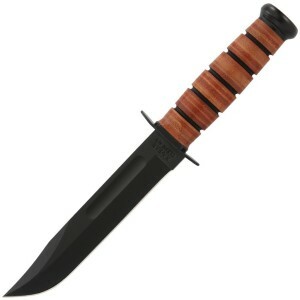 Click here to get the USMC Fighting Knife on Amazon! Have you read all of the Bowie knife reviews presented to you and not chosen the best one for you? Then you may find it useful to read some of the customer reviews on Amazon or checking out couple of forums dedicated to knives to find more inspiration.